Fine, forget the tired jokes. Watch the video. It’s the truth, people! Thirty-five and kid? Let’s not even talk about it, OK? What we should talk about is that we ladies need good support while running. And for once I don’t mean mandating your significant other to cheer you along the course and bring you flowers at the finish line. Obviously, finding the right bra is extremely important for women runners. Let’s just say that all that bouncing up and down ain’t going to help counteract gravity, but the right sports bra will at least counteract the bouncing issue. 1. My SkirtSports bra, already two + years old (and – oh no! – is it no longer available for sale?). It has a pocket on the inside, right there in between the girls. Very handy for storing cash in a little Ziploc baggie, though be warned: the people at coffee shops/ delis/ gas stations will balk when you reach in there to get your money. Now, even with those two lovely bras at my service, most of the time I run in sleeveless tanks from SkirtSports that, believe it or not, have yet another bra built in! But it’s been a while and my two faves have faithfully served me for longer than even the best of bras ever could. (The typical shelf life of a sports bra is said to be three months to a year, if properly cared for — meaning wash in cold water, line dry. Who does that? Seriously. Anyone not toss their workout clothes in the clothes drier?). The bra should be tight enough to feel slightly uncomfortable after, say, 5 hours of continuous wear. Those things are supposed to be worn for a few hours at a time, not all day. Pick one that’s too loose, and you’ll have the bouncing issue mentioned above: not a good thing. Like most any other mother, I would like to not flash the headlights at anyone who’s looking at me a mile or two into a sweaty run. Know what I mean? That little inside pocket is easy to get used to — hard to give up. All sports bras should have one! And less unnecessary fabric on the back, please! I like my racerback tops, but the added coverage of the bra isn’t helping my tan line (yes, there is just one, going down the middle of my back). Oh, and speaking of awesome ideas (very smooth at segues, I am), did you hear about the bra exchange at Nike Women’s Marathon in San Francisco? It goes like this: So a runner walks into a bra… Ha! No, but right on the course of that race was a table-full of bras of all kinds of sizes plus fitting rooms to walk in and change. Then run on. 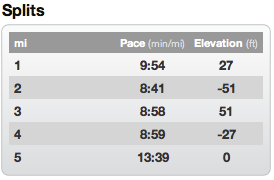 Once I warmed up for a mile, I just went at it the rest of the way. Take that, cold! 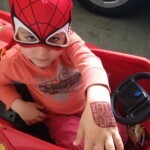 Back home, I was greeted by this fit little guy (dressed up as a Power Ranger, mind you, not Spiderman for sure). 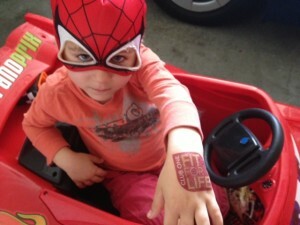 The temporary tattoo (it is temporary, I hope?) is from a race expo, I think. Well. Fit for life, friends!